I installed Jajah's firefox extension yesterday and it just rocks. I just love the way these guys are developing their business. The FF extension is a great move adding a lot of convenience for customers. Here's a little account of a user's experience. To me the coolest feature is that the extension is able to identify phone numbers being displayed on pages I am visiting. These phone numbers appear in white characters on a Jajah-purple background and if I want to call any of those, all I have to do is just click on the number and Jajah does the rest. Mega cool. 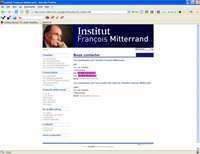 The picture is an example of a page of a site contiaing phone numbers.